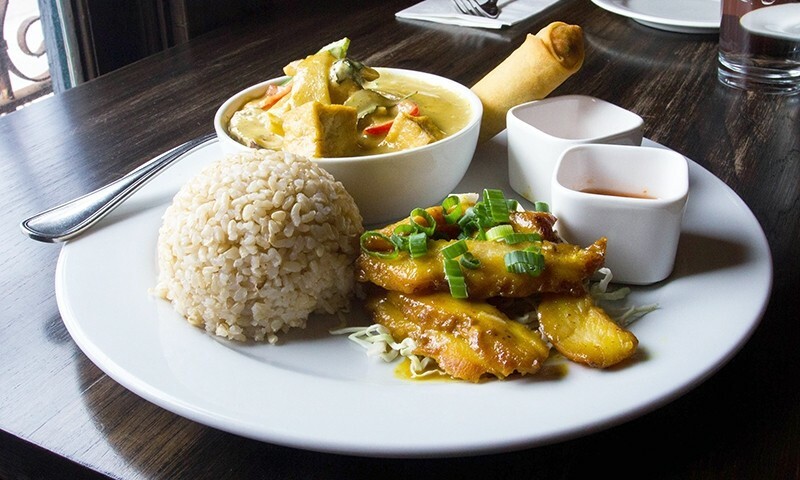 The Green Tofu Curry with perfectly tender and juicy Grilled Lemongrass Chicken hits the spot any day of the week. I love restaurants in re-purposed houses. So much emotional work is done with this simple setting—you are an invited guest, you are home again, you are part of an ongoing history. This restaurant’s space is like a home turned church, turned restaurant. It has an adapted, lived-in feel—a little gentrified, but modestly proud. Two peaked windows in the dining room fetch in plenty of natural light, brightening the muted color scheme of brown and cream—and at nighttime, the festive lights of Trolley Square are just across the street. The south half block east from Trolley Square is one of the few remaining commercial bits of Salt Lake left with an old town feeling, particularly now that malignant developers have monstrously destroyed the charm of old Sugarhouse. I have dined at Skewered Thai for lunches and late lunches, because I am a polite and compliant servant of the masses and work every night, (except Tuesdays, when I am a compliant and polite homebody). As this is a rice house, aside from the name, I have yet to see a skewer, but I haven’t yet had the larger dinner-size servings of meat, so they might appear in that context. There is both white and brown rice available for each lunch. I have always experienced brown rice as horrible, hippy-dippy food (though I liked tofu, sprouts and even Vegemite on the first try), but I have been changed by this restaurant. I actually liked the brown rice with this food—for me, it’s a whole new taste landscape. I imagine it would annoy in some more delicate rice dishes—fish and vegetable at my favorite Chinese, and I bet it would ruin sushi and risotto—but the firmly planted flavors of this fresh and mild Thai take the brown rice famously (the white rice is also very good, of course). For lunch, $9 gets you a three- or four-course meal. First, a little salad: Thai peanut dressing, thin and a little sweet, over chopped iceberg lettuce with maybe four strips of fried won-ton skin and a twist of carrot. It is modest, but enough. This is amended later with the arrival of fried vegetable rolls, served with a honey-colored sweet sauce. They are crisp and quickly gone. With the salad and egg roll, you have the choice of a plate-full of noodles or a pair of dishes selected from a list of 12 to be eaten with rice. The noodle plates are largish portions and dependably consistent, but not as peppy or engaging as some of the other Thai places I frequent. The noodle dishes, particularly the Pad Thai and the Pad Siew, are languorous and satisfying. The Drunken Noodles (Pad Kee Mao) are better students, presenting themselves smartly with a little crackle of heat and flavors interesting enough to make each forkful a little lesson in pleasure. This dish takes the $2 splurge for shrimp particularly well. As far as rice dishes go, the three color curries are all good bets. The flavor of the yellow and the green differ only around the edges—the green having more of a yellow curry flavor than my experience expects. The flavors of these two are saturated and only moderately spicy. They are fresh without being too bright on the tongue. The red curry takes a lower note on my taste buds initially, but fans out nicely. I like the red curry here very much—my co-conspirators favor the green. The Massaman Curry is more peanut-edged, and not as sweet as some of the other versions in town, which is a good thing. After tasting the Basil Stir Fry (Pad Ga Prow), I just couldn’t tell it apart in flavor from the Pad Prik Khing (both seemed like a version of the latter, after a fashion). The first should be strongly basil- and fish-sauce flavored, and the latter richly red curried, but without the relief of coconut milk. Neither one of these dishes, as I ordered them, filled those expectations. All Thai food is village food to a large extent, or so I am told. I suppose the cook in charge at Skewered Thai just sees things differently than I. Both dishes are tasty, though I don’t recognize either as a version of what they claim. The meat choices, Grilled Lemongrass Chicken and BBQ Pork (Moo Yang) are sublime. 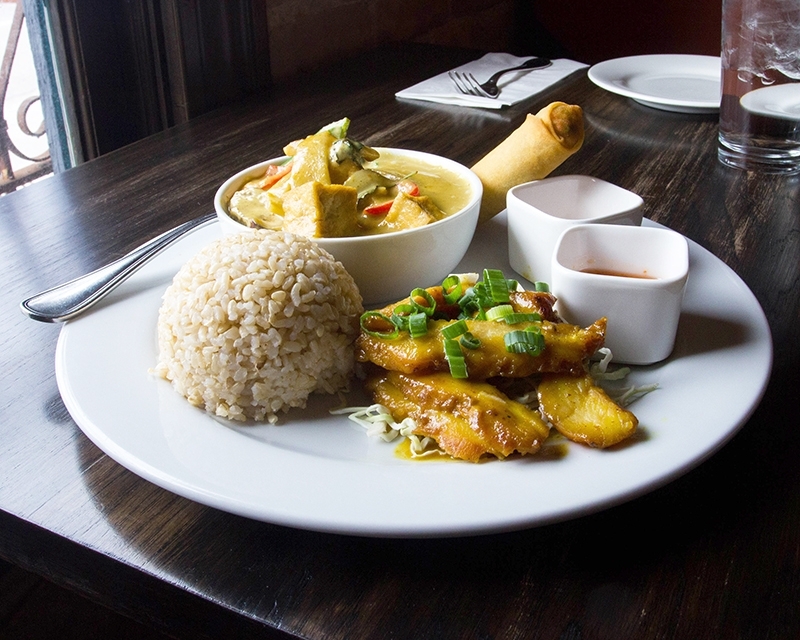 The chicken is succulent, and the flavors string out delicately from lemongrass to saline to flesh. The BBQ Pork has a rightness about it that closes my eyes for just a moment on the first bite. These morsels make me hungry for more. This is an affordable, clean, somewhat formal but welcoming little restaurant, and it should be on your lunch list, if Asian is your bag. Dinner is also served after 3 p.m. with a larger menu. The food is solid, generous, and—though not scorching or brash—it is also free from the too-sweet posturing of some local Thai dinners.